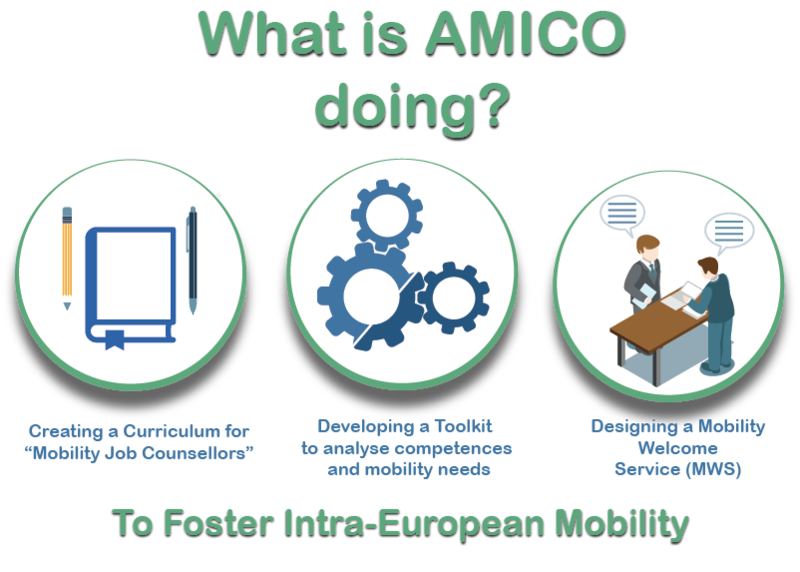 Project AMICO aims to facilitate labour mobility among European countries. As pointed out by the European Commission in the EU citizenship report 2013 “EU citizens: your rights, your future”, proper labour mobility would enable to effectively tackle the mismatch of qualifications in Europe. However, its potential is not fully exploited yet. Even though European people show a high propensity to transnational job mobility, labour mobility rates are still low. One of the reasons is the lack of services in support of people interested in geographical labour mobility, both incoming (employers) and outgoing (job seekers). Project AMICO wants to contribute to fill this gap, improving the provision of service and producing practical tools in support of people willing to mobilise. In particular, AMICO will focus on geographical mobility in the ICT sector, a field where the mismatch is increasingly rising. However, special attention will be given to the transferability of AMICO experience so that it can be easily replicated in all Member Countries and to different sectors.